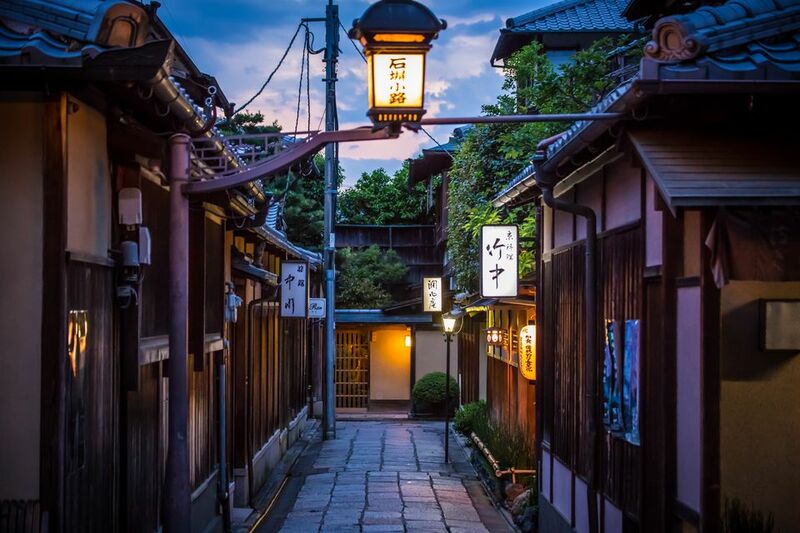 Gion is Japan as we imagine it: It’s a place where you can dine with geisha, drink tea in an old wooden machiya, and savor kaiseki made by Michelin-star chefs. It’s also a place that yields the most picturesque stock photographs of Kyoto, where #travel Instagram truly shines. However, the result of this is unwieldy throngs of tourists, who crowd the nostalgic alleyways with chunky backpacks and unfathomable selfie-sticks. But don’t let the crowds stop you from fully enjoying this quintessential Kyoto neighborhood. Knowing the following insider tips makes it easier to see and appreciate all of Gion’s sites, capture some enviable photos, and perhaps even get you a table with Kyoto’s most elusive kimono-clad entertainers. Kyoto’s Gion neighborhood stretches from Yasaka Shrine in the east, to the Kamo river in the west. Lining this bustling thoroughfare are dozens of shops, selling goods ranging from fine tea to cutesy Hello Kitty merch. Head south to walk along Hanami-koji lane, and admire the rows of preserved machiya (traditional Japanese townhouses), many of them serving kaiseki and other first-rate Japanese cuisine. Among these structures are some ochaya, exclusive members-only teahouses where geisha receive guests. Gion is known as Kyoto’s foremost “geisha district.” Some syrupy depictions in Western popular culture have led us to believe that geisha are courtesans or prostitutes, but in fact, geisha are entertainers, women who have mastered an array of Japanese traditional arts. They are divided by their level of seniority into two types, geiko and maiko. The novice maiko, who are only around 15-20 years of age, are usually fully made-up in white, with lavish kimono and dangling hairpins. The older geiko typically wear wigs in a less ornate style, and a simpler kimono with shorter sleeves. Naturally many people travel to Japan with the hope that they’ll be able to see or meet a real geiko or maiko. If you spot one on the street, use your manners. While it might be permissible to snap a discreet pic, it’s certainly not polite to stalk them with your camera like a paparazzo. Respect their space, it’s likely they’re on their way to work. In all seriousness, if you do want to meet a Kyoto geisha, there are places in Gion where you can make this wish a reality. In the case that you’re visiting Japan during the summer, check out one of Kyoto’s many maiko beer gardens, which provide a relaxed setting in which to connect with novice geisha. Gion Shimonso is a traditional Japanese inn (ryokan) that offers a rooftop beer garden in the hotter months. Your admission fee gets you a small dinner, and the once-in-the-lifetime chance to have a conversation with a maiko over a beer or two. After dinner, she performs two kyomai, or Kyoto-style dances. More information on reserving your spot can be found here. If you’re not visiting Kyoto in the summer and have some extra cash to spare, ryokan Gion Hatanaka offers another geisha experience. Admission gets you a Japanese dinner in a tatami room, and a chat with a real Gion maiko. Reservations are required. There are also some notable temples and shrines in the Gion area, including Kennin-ji, which rests at the southern end of Hanami-koji lane. Founded in 1202, this is the oldest Zen temple in Kyoto. For a small admission fee, you can stroll through the two remarkable rock gardens on the grounds: one, aptly named “Circle Triangle Square,” contains these three shapes in stone and sand form, purportedly made to represent water, fire and earth. After meditating on these dry landscapes, check out the pair of painted dragons on the ceiling of the temple’s dharma hall. Rendered by a contemporary Japanese artist for the temple’s 800th anniversary in 2002, these fierce creatures have been criticized by Kyoto locals for looking a little too much like anime characters. Yasaka Shrine is also not to be missed. If you’re in Kyoto in July, you’re likely to catch the incredible Gion Matsuri, a large-scale festival with a stunning procession that begins and ends at this Shinto shrine. To the east is Maruyama Park, one of the best spots to lay down a picnic blanket and lounge under the cherry blossom trees in the early weeks of spring. Stumble into any restaurant in the neighborhood, and you’re more than likely to encounter reliably tasty, if not delicious, Kyoto cuisine. If you’re seeking an authentic Japanese breakfast experience, go to the peerless Kishin Kitchen. Committed to using fresh, organic ingredients, this restaurant leaves an impression that lingers long after you’ve finished your last grain of rice. For an inexpensive lunch, head to Gion ya, an inconspicuous eatery serving standard Japanese fare that hits the spot after a morning of heavy sightseeing. Order any one of their soba dishes, or try their surprisingly flawless oyakodon. Or, if you’re ready to embark on a true culinary journey, make a dinner reservation for kaiseki at Kyoto Nanba, a restaurant that crafts course after course of exquisite dishes that shift with the changing seasons. But don’t forget to save room for dessert – Gion is also known for its sweets shops. Make sure to try yatsuhashi, a triangle-shaped delicately sweet treat made of glutinous rice flour, sugar, and cinnamon. For your matcha ice cream fix, go to Tsujiri, the sovereign leader in green tea desserts. Skip the long lines of people waiting to eat in the café on the second floor, and instead grab a soft-serve from the storefront below. As for coffee, trade your Starbucks for the cappuccinos at Yojiya Café, a Kyoto staple known for its trademark latte art. This café serves an assortment of unique cakes, cookies and matcha pancakes. Yojiya is also a brand of popular cosmetics, and customers can shop for beauty staples after getting their caffeine fix. As Gion lies in the geographic heart of Kyoto’s site-seeing districts, tourist-friendly hotels are plentiful. For great hospitality that doesn’t break the bank, try APA Hotel Gion or Hotel Sasarindo, conveniently located along the main drag of Shijo street, right in the center of it all. Ryokan are superb alternatives to regular hotels, but you might want to limit your stay to a night or two, as prices tend to be on the steeper side. Aside from the above-mentioned Gion Shimonso and Gion Hatanaka, there’s also Fukuzumi and Yoshi-Ima, two more excellent ryokan offering traditional Japanese lodgings and Kyoto-style meals.